Arranged marriages were very common throughout the world until the 18th century. Typically, marriages were arranged by parents, grandparents or other relatives. Some historical exceptions are known, such as courtship and betrothal rituals during the Renaissance period of Italy and Gandharva marriages in the Vedic period of India. In China, arranged marriages (baoban hunyin, 包辦婚姻) - sometimes called blind marriages (manghun, 盲婚) - were the norm before the mid 20th century. A marriage was a negotiation and decision between parents and other older members of two families. The boy and girl were typically told to get married, without a right to consent, even if they had never met each other until the wedding day. The Ambitious Mother and the Obliging Clergyman - a cartoon by Charles Dana Gibson caricaturing arranged marriages in early 20th century United States. A parent insists their daughter marry a man on grounds of wealth or aristocratic title, without considering the girl's wishes. 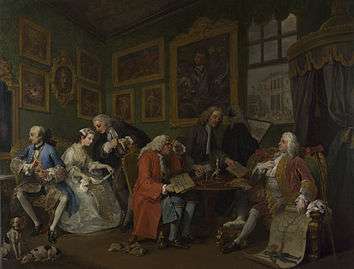 The clergyman is caricatured officiating the marriage with a blindfold. Consanguineous marriage: is a type of arranged endogamous marriage. It is one where the bride and groom share a grandparent or near ancestor. Examples of these include first cousin marriages, uncle-niece marriages, second cousin marriages, and so on. The most common consanguineous marriages are first cousin marriages, followed by second cousin and uncle-niece marriages. These types of arranged marriages are most common in Muslim communities of the world. Between 25 and 40% of all marriages in parts of Saudi Arabia and Pakistan are first cousin marriages; while overall consanguineous arranged marriages exceed 65 to 80% in various regions of the Middle East, North Africa and Islamic Central Asia. Consanguineous marriages are against the law in many parts of United States and Europe. In the United Kingdom, uncle-niece marriages are considered incestuous and are illegal, but cousin marriages are not considered incestuous by the law and are legal, although there have been calls to ban first-cousin marriages due to health concerns. While consanguineous arranged marriages are common and culturally preferred in Islamic countries and migrants from Muslim countries to other parts of the world, they are culturally forbidden or considered undesirable in most Christian, Hindu and Buddhist societies. Consanguineous arranged marriages were common in Jewish communities before the 20th century, but have declined to less than 10% in modern times. Child marriage, particularly those below the age of 12, does not prepare or provide the individual much opportunity to make an informed, free choice about matrimony. These child marriages are implicitly arranged marriages. In rural areas of sub-Saharan Africa, South Asia and Latin America, poverty and lack of options such as being able to attend school leave little choice to children other than be in early arranged marriages. Child marriages is primarily seen in areas of poverty. Parents arrange child marriages to ensure their child’s financial security, reinforce social ties, believe it offers protection, and reduce the daughters economic burden on the family due to how costly it is to feed, clothe and educate a girl. By marrying their daughter to a good family the parents improve their social status by establishing a social bond between each other. Late marriage, particularly past the age of 30, reduces the pool of available bachelorettes for autonomous marriages. Introductions and arranged marriages become a productive option. Migrant minority ethnic populations have limited choice of partners, particularly when they are stereotyped, segregated or avoided by the majority population. This encourages homogamy and arranged marriages within the ethnic group. Examples of this dynamic include Sikh marriages between 1910 and 1980 in Canada, homogamous quasi-arranged marriages between European descent South Africans, arranged marriages among Hasidic Jews, and arranged marriages among Japanese American immigrants before the 1960s, who would travel back to Japan, to marry the spouse arranged by the family, and then return married. In other cases, a girl from Japan would arrive in the United States as a picture bride, pre-arranged to marry the Japanese American man on arrival, whom she had never met. Many cultures traditionally seek endogamous marriages. A prominent example of this practice is the Hindu culture where the bride and groom belong to the same caste, but are non-consanguineous, that is the bride and groom are not blood relatives nor extended family members. Other examples of cultures following the endogamous arranged marriage tradition include Amish people in United States, Orthodox Jews in Canada, the United States, Israel, and Western Europe, Arab Christians such as Coptic Christians in Egypt. Marriage was a central feature of traditional Aboriginal societies. Freedom of marriage was restricted to ensure children were produced according to the correct family groups and affiliations and avoid marriages with certain close relatives or marriages with any one outside the group. Marriages were mostly arranged by infant betrothal; it was even possible for a girl to be engaged before she was born. The promised relationship between the young man and woman, creates a series of lifelong responsibilities and obligations. Arranged marriage is also the tradition of many Islamic nations of West Asia and North Africa, but with the difference that between 17% to majority of all marriages in these countries are also consanguineous marriages. The practice of endogamous consanguineous marriage dramatically limits the marriagable pool; it inherently encourages marriages arranged according to tradition and birth. Over 1.3 billion people, predominantly of Islamic faith, practice endogamous consanguineous arranged marriages. Consanguineous arranged marriages are presently also observed, though to a much lesser extent, in some ethnic groups of Africa, India, Indonesia, Polynesia and South America. In Pakistan and Saudi Arabia, majority (65%+) of all marriages are endogamous and consanguineous arranged marriages. More than 40% of all marriages are endogamous and consanguineous in Iraq, Iran, Jordan, Syria, Yemen, Kuwait, UAE, Oman, Sudan, Libya and Mauritania; and over 1 in 5 marriages in Turkey, Egypt, Algeria, regions of Nigeria, India and Malaysia with high Muslim populations are endogamous and consanguineous arranged marriages. Among these Islamic populations, arranged marriages include endogamous and non-consanguineous marriages, and therefore exceed the above observed rates of endogamous and consanguineous marriages. Arranged marriages across feudal lords, city states and kingdoms, as a means of establishing political alliances, trade and peace were common in human history. When a king married his son to a neighboring state’s daughter, it indicated an alliance among equals, and signaled the formers state superiority. 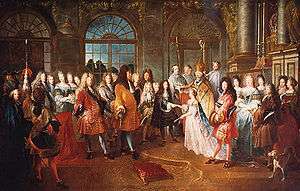 For example, the fourth daughter of Maria Theresa, Queen of Austria-Hungary, Marie Antoinette, married the dauphin (crown prince) of France, who would become King Louis XVI. Tongyangxi, also known as Shim-pua marriage in Taiwanese - literally child or little daughter-in-law - was a tradition of arranged marriage, in which a poor family would arrange and marry a pre-adolescent daughter into a richer family as a servant. The little girl provided slave-like free labour, and also the daughter-in-law to the adoptive family's son. This sort of arranged marriage, in theory, enabled the girl to escape poverty and wealthy family to get free labour and a daughter-in-law. Zhaozhui was a related custom by which a wealthy family that lacked an heir would arrange marriage of a boy child from another family. The boy would move in with the wealthy family, take on the surname of the new family, and marry the family's daughter. Such arranged marriages helped maintain inheritance bloodlines. Similar uxorilocal arranged marriages to preserve wealth inheritance were common in Korea, Japan and other parts of the world. In many cultures, particularly in parts of Africa and the Middle East, daughters are valuable on the marriage market, because the groom and his family must pay cash and property for the right to marry the daughter. This is termed as bride-wealth and locally, by various names such as Lobola and Wine Carrying. The bride-wealth is typically kept by the bride's family, after the marriage, and is a source of income to poor families. The brothers, father and male relatives of the bride typically take keen interest in arranging her marriage to a man who is willing to pay the most wealth in exchange for the right to marry her. Some religious denominations recognize marriages only within the faith. Of the major religions of the world, Islam forbids marriage of girls born to a devout parent to a man who does not belong to that religion. In other words, Islam forbids marriage of Muslim girls to non-Muslim men, and the religious punishment for those who marry outside might be severe. This is one of the motivations of arranged marriages in Islamic minority populations in Europe. Some Christian denominations allow marriage between Christian and a non-Christian. 1 Corinthians 7:14 states that "the unbelieving husband has been sanctified by his wife, and the unbelieving wife has been sanctified by her believing husband." Arranged marriages are actively debated between scholars. The questions debated include whether arranged marriages are being used to abuse international immigration system; whether arranged marriages inherently violate human rights, particularly women's rights; whether they yield more stable marriages for raising children, the next generation; and whether there is more or less loving, respectful relationship for the married couple. In the United Kingdom, public discussion has questioned whether international arranged marriages are a sham, a convenient means to get residency and European citizenship to some male or female immigrants, who would otherwise be denied a visa to enter the country. These fears have been stoked by observed divorces once the minimum married residence period requirement is met. MP Ann Cryer has alleged examples of such abuse by West Asian Muslim families in her motion to the UK's House of Commons. The United States has seen a similar controversy with sham arranged marriages. Various international organizations, including UNICEF, have campaigned for laws to ban arranged marriages of children, as well as forced arranged marriages. Article 15 and 16 of The Convention on the Elimination of All Forms of Discrimination Against Women (CEDAW) specifically cover marriage and family law, which support such as ban. Arranged marriages are a matter of debate and disagreements. Activists such as Charlotte Bunch suggest that marriages arranged by parents and other family members, typically assume heterosexual preference and involve emotional pressure; this drives some individuals into marriages that they consent under duress. Bunch suggests that marriages should be autonomous. Michael Rosenfeld says that the differences between autonomous marriages and arranged marriages are empirically small; many people meet, date and choose to marry or cohabit with those who are similar in background, age, interests and social class they feel most similar to, screening factors most parents would have used for them anyway, according to Rosenfeld. Assuming the pool from which mates are screened and selected is large, Rosenfeld suggests that the differences between the two approaches to marriages are not as great as some imagine them to be. Others have expressed sentiments similar to Rosenfeld. Divorce rates have climbed in the European Union and the United States, with increase in autonomous marriage rates. The lowest divorce rates in the world are in cultures with high rates of arranged marriages such as Amish culture of United States (1%), Hindus of India (3%), and Ultra-Orthodox Jews of Israel (7%). According to a 2012 study by Statistic Brain, 53.25 percent is the amount of marriages that are arranged worldwide. The global divorce rate for arranged marriages was a significant low number of 6.3 percent. This low statistic shows the success rate of arranged marriages. This has led scholars to ask if arranged marriages are more stable than autonomous marriages, and whether this stability matters. Others suggest that the low divorce rates may not reflect stability, rather it may reflect the difficulty in divorce process and social ostracism to the individuals, who choose to live in a dysfunctional marriage rather than face the consequences of a divorce. Also, the perception of high divorce rates attributed to self-arranged marriages in the United States is being called into question and no authoritative data is available to support the theory that Hindus of India continue to enjoy low divorce rates. There is a difference in observed divorce rates between various types of arranged marriages. The divorce rates in Islamic countries with consanguineous arranged marriages such as Saudi Arabia, Turkey, Egypt, Qatar, Jordan is between 20% to 35%, in contrast to less than 10% divorce rates in non-consanguineous arranged marriages among Amish people, Hindus and Orthodox Jews. ↑ "Courtship and Betrothal in the Italian Renaissance". metmuseum.org. ↑ Nour, Nawal M (2009-01-01). "Child Marriage: A Silent Health and Human Rights Issue". Reviews in Obstetrics and Gynecology. 2 (1): 51–56. ISSN 1941-2797. PMC 2672998 . PMID 19399295. ↑ Chawkins, Steve (January 15, 2009). "Teen's arranged marriage is allowed in native Mexico". Los Angeles Times. Archived from the original on February 20, 2009. ↑ "Omiai and Miai-gekkon, Arranged Marriages in Japan". hanamiweb.com. 6 November 2007. 1 2 "Marriage in Traditional Aboriginal Societies". ALRC. 2016. 1 2 "Married to France: 1770-1780". Marie Antoinette and the French Revolution. pbs.org. Retrieved 2016-05-17. ↑ Lin Yuju (2011). "Zhaozhui son-in-law". Encyclopedia of Taiwan. Council for Cultural Affairs. ↑ Coleman, D. A. (2004), Partner choice and the growth of ethnic minority populations Archived June 18, 2015, at the Wayback Machine., Bevolking en Gezin, 33(2), 7-34. ↑ Razack, Sherene H. (October 2004). "Imperilled muslim women, dangerous muslim men and civilised Europeans: legal and social responses to forced marriages". Feminist Legal Studies. Springer. 12 (2): 129–174. doi:10.1023/B:FEST.0000043305.66172.92. ↑ "It's All Relative: The Contemporary Orthodox Jewish Family in America - Institute for Jewish Ideas and Ideals". jewishideas.org. ↑ "Arranged / Forced Marriage Statistics – Statistic Brain". www.statisticbrain.com. Retrieved 2016-05-17. ↑ "The Divorce Surge Is Over, but the Myth Lives On". New York Times. Xu Xiaohe; Martin King Whyte (Aug 1990). "Love Matches and Arranged Marriages: A Chinese Replication". Journal of Marriage and Family. 52 (3): 709–722. doi:10.2307/352936. ↑ David R. Johnson; Lauren K. Bachan (Aug 2013). "What can we learn from studies based on small sample sizes? Comment on Regan, Lakhanpal, and Anguiano (2012)". Psychological Reports. 113 (1): 221–224. doi:10.2466/21.02.07.PR0.113x12z8. PMC 3990435 . PMID 24340813.